Author(s): Antonella Di Pizio, Mariangela Agamennone, Paolo Tortorella. Dipartimento di Farmacia- Scienze del Farmaco, Universita “A. Moro” di Bari, via Orabona 4, 70125 Bari, Italy. Matrix metalloproteinases (MMPs) are zinc enzymes responsible for the degradation of the extracellular matrix. With this function, MMPs are involved in many physiological processes, but also in many pathological states. MMP-13 is implicated in the degradation of type II collagen, the main structural protein of articular cartilage, contributing to the development of osteoarthritis and inflammatory diseases. In the last years, a new generation of potent and selective MMP inhibitors (MMPIs) has been identified and classified as non-zinc-binding inhibitors (NZBIs). Several MMP-13 NZBIs have been developed and crystallographically determined in complex with the enzyme. 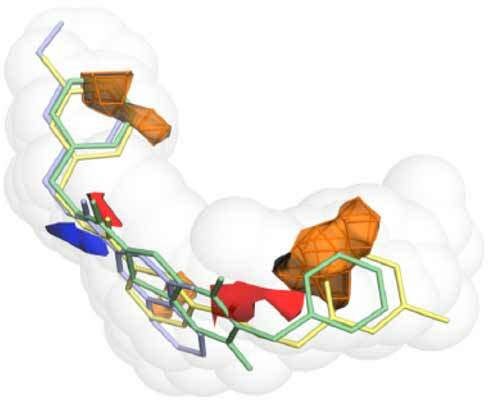 Here, we provide a detailed review of the current knowledge about this class of MMP-13 inhibitors and, by using computational procedures, we highlight the molecular determinants that are needed for the binding process. In particular, FLAP, a program based on GRID molecular interaction fields, was used to analyze the ligand-protein interactions: molecular shape and hydrogen bond acceptor groups strongly influence the binding according to the ligand-based modeling, while the aromatic interactions are better identified by the structure-based study. The complementary results can be combined in a high performance model, showing the effectiveness of molecular interaction field based approaches to search for novel MMP-13 NZBIs. Keywords: Drug design, Binding pocket, GRID, MMP-13, Molecular modeling, Molecular similarity, Non-zinc-binding inhibitors. Affiliation:Dipartimento di Farmacia- Scienze del Farmaco, Universita “A. Moro” di Bari, via Orabona 4, 70125 Bari, Italy. Keywords:Drug design, Binding pocket, GRID, MMP-13, Molecular modeling, Molecular similarity, Non-zinc-binding inhibitors. Abstract:Matrix metalloproteinases (MMPs) are zinc enzymes responsible for the degradation of the extracellular matrix. With this function, MMPs are involved in many physiological processes, but also in many pathological states. MMP-13 is implicated in the degradation of type II collagen, the main structural protein of articular cartilage, contributing to the development of osteoarthritis and inflammatory diseases. In the last years, a new generation of potent and selective MMP inhibitors (MMPIs) has been identified and classified as non-zinc-binding inhibitors (NZBIs). Several MMP-13 NZBIs have been developed and crystallographically determined in complex with the enzyme. Here, we provide a detailed review of the current knowledge about this class of MMP-13 inhibitors and, by using computational procedures, we highlight the molecular determinants that are needed for the binding process. In particular, FLAP, a program based on GRID molecular interaction fields, was used to analyze the ligand-protein interactions: molecular shape and hydrogen bond acceptor groups strongly influence the binding according to the ligand-based modeling, while the aromatic interactions are better identified by the structure-based study. The complementary results can be combined in a high performance model, showing the effectiveness of molecular interaction field based approaches to search for novel MMP-13 NZBIs.